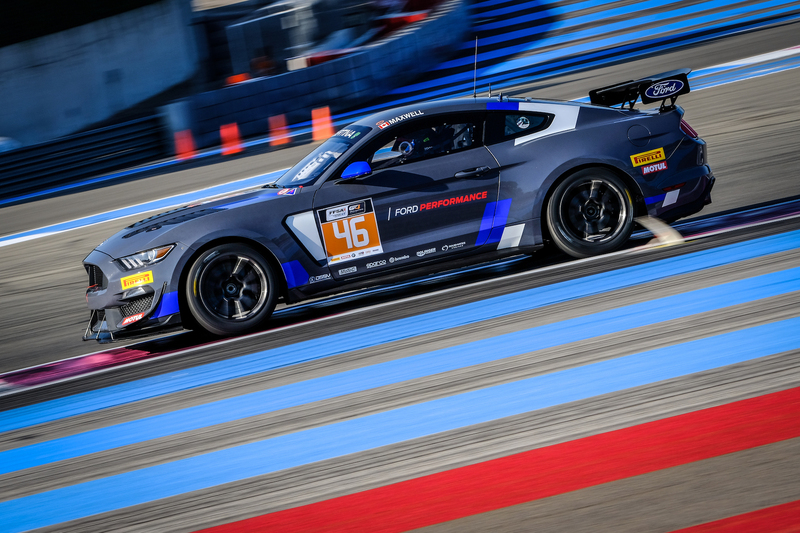 In a race where the final result was decided as much in the Race Control office as it was on track, victory went to the #116 ERC Sport Mercedes-AMG GT3 driven by Lee Mowle and, taking the car to the chequered flag, Yelmer Buurman. 4.352 seconds behind, in second place, was the #17 TF Sport Aston Martin V12 Vantage piloted by Derek Johnston and Marco Sorensen. However, post-race penalties were to add 30 seconds to the finishing time of the #17 car and moved it to seventh. The #7 Team Parker Racing Ltd Bentley Continental GT3 with the driver line-up of Ian Loggie and Callum Macleod completed the top three finishers, 19.4 seconds behind the #17 entry. In GT4, victory went to the #55 HHC Motorsport Ginetta G55 GT4 driven by Patrick Matthiesen and Callum Pointon with second in class going to the Stephen Johansen / Jesse Anttila-piloted #54 UltraTek Racing Team RJN Nissan 370Z GT4. Taking the final podium position in the GT4 category was the #62 Academy Motorsport Aston Martin V8 Vantage driven by Will Moore and, taking the second stint, Matt Nicoll-Jones. 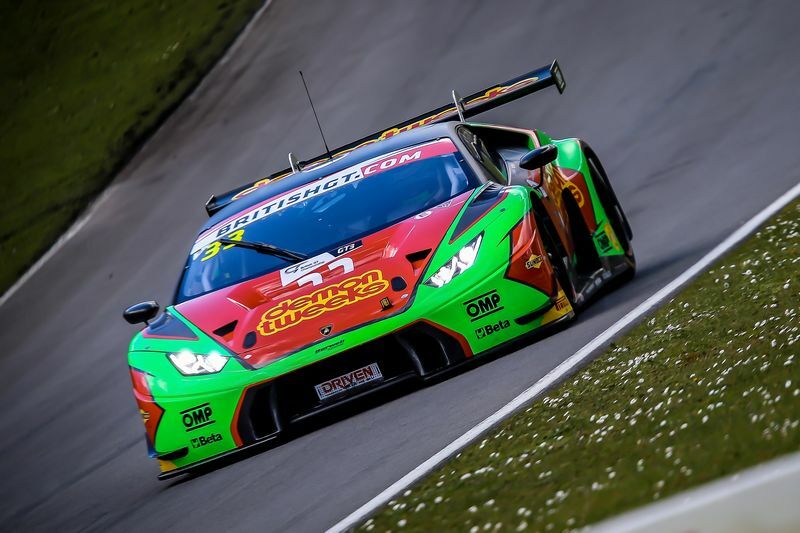 Jon Minshaw, at the wheel of the #33 Barwell Motorsport Lamborghini Huracán GT3, led the field from pole position at the start, closely followed by Flick Haigh in the #75 Optimum Motorsport Aston Martin V12 Vantage. Taking most advantage of the start, however, was series newcomer Sam De Haan, taking the first stint in the sister #69 Barwell Motorsport Lamborghini. De Haan moved into third position, less than a quarter of a second behind Flick Haigh, after ten minutes. The race was neutralised with the first of four safety car periods after Shaun Balfe in the #101 Balfe Motorsport McLaren 650S GT3 hit the wall at Turn 12 after 13 minutes. Seven minutes would elapse before the race could resume green-flag running. At the re-start Flick Haigh spun on oil and dropped down the field, allowing Graham Davidson in the #47 Jetstream Motorsport Aston Martin to move in to third. Jon Minshaw, meanwhile, was looking to consolidate his lead in the #33 entry but was frustrated by a second Safety Car period when the #50 HHC Motorsport Ginetta GT4, driven by Mike Newbould, spun at T5. Recovery meant the race was neutralised for four minutes, allowing the field to again close up. As the pit-window approached Minshaw continued to hold the lead ahead of Davidson with De Haan in third. There was drama for reigning GT3 champion Rick Parfitt Jnr after contact with Derek Johnston in the #17 TF Sport Aston Martin resulted in a spin at Turn 9, dropping the #1 car down the order. In what was very much a ‘game of two halves’ things got really interesting as the race moved into its second hour. After the driver-changes had cycled through, the third safety-car period of the race with 46 minutes to go allowed the field to close up and, when racing resumed, it was the #47 Jetsteam Motorsport entry, now with Maxime Martin at the wheel, that held a slim lead over Phil Keen in the #33 Barwell Motorsport Lamborghini. Drama, however, was about to unfold when the #47 entry was handed a stop-go penalty for track limit infringements. Phil Keen then took a short-lived lead before the #33 entry was given a stop/go penalty for a pit infringement. With 20 minutes remaining, Yelmer Buurman, now behind the wheel of the #116 ERC Sport Mercedes took the lead. Marco Sorensen, driving the #17 TF Sport Aston pushed hard but was unable to get closer than a little over two seconds from the lead car. Darren Turner, taking the second stint in the #99 Beechdean AMR Aston Martin looked set to take the final podium position but was chased down by Callum Macleod in the #7 Team Parker Racing Bentley Continental GT3 in the last 5 minutes. Turner finished fourth. There was trouble for the #75 Optimum Motorsport entry after a fire at the driver change delayed the Jonny Adam leaving the pit, the car eventually finishing fifth. Post-race, however, there was to be more discussion after the #17 TF Sport Aston Martin was given a 30 second penalty for involvement in the spin of Rick Parfitt Jnr in the #1 Team Parker Racing Bentley. As a result, the #99 Beechdean AMR Aston Martin V12 Vantage, driven by Andrew Howard and Darren Turner, moved up the order to be awarded the final podium position. The GT4 category saw a closely fought battle in the first hour between Charlie Fagg in the #4 Tolman Motorsport McLaren 570s GT4 who led from class pole and Patrick Matthiesen in the #55 HHC Motorsport Ginetta G55 GT4. After the driver changes had cycled through it was Callum Pointon, now driving the #55 entry that held the lead with Michael O’Brien behind the wheel of the #4 Tolman Motorsport entry in second. With fifteen minutes remaining, Jesse Antilla, driving the #54 UltraTek entry moved in to second place, a position he held to the chequered flag, with Matt Nicoll-Jones moving in to the final podium position in the final 5 minutes. 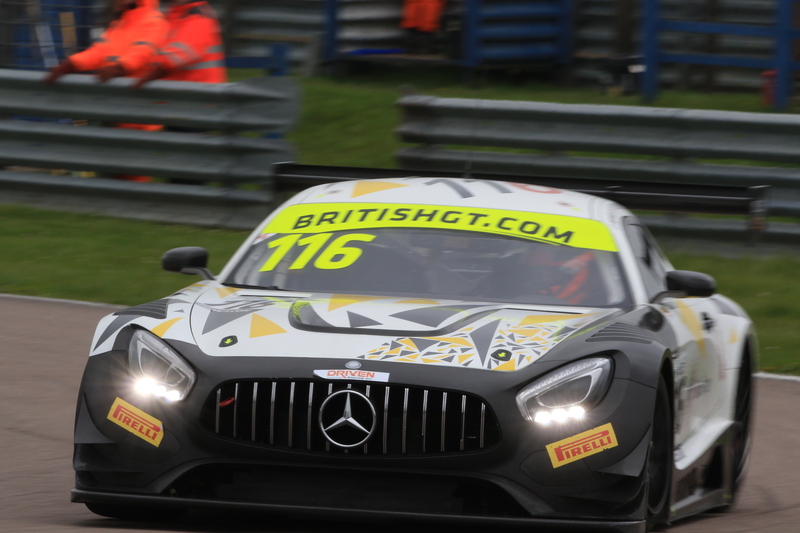 Rounds Four and Five 0f the 2018 British GT Championship takes place at Snetterton on May 26 –27.